The stakeholder group in healthcare that has been the most reluctant to adopt and to engage on social media is arguably pharma. Cultural and regulatory concerns have long delayed their entry. Today, much has changed and each year we’re seeing more and smarter behavior by pharma on social media. Their presence is welcome, patients have long asked for pharma to become part of the conversations and listen to what they have to share. But this is a learning process for all of us, proper behavior has to be explored, tested and improved. We’re not going to figure this out overnight. Using Symplur Signals, the healthcare social media analytics platform, with access to the social conversations from ASCO’s Annual Meetings the past 7 years, we have taken a look at one short story this data reveals to us. 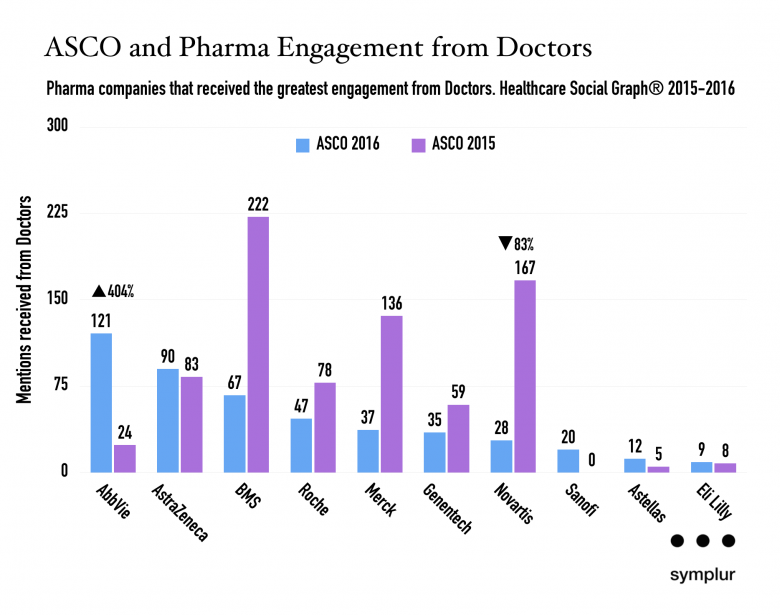 Pharma companies that received the greatest engagement from Doctors. 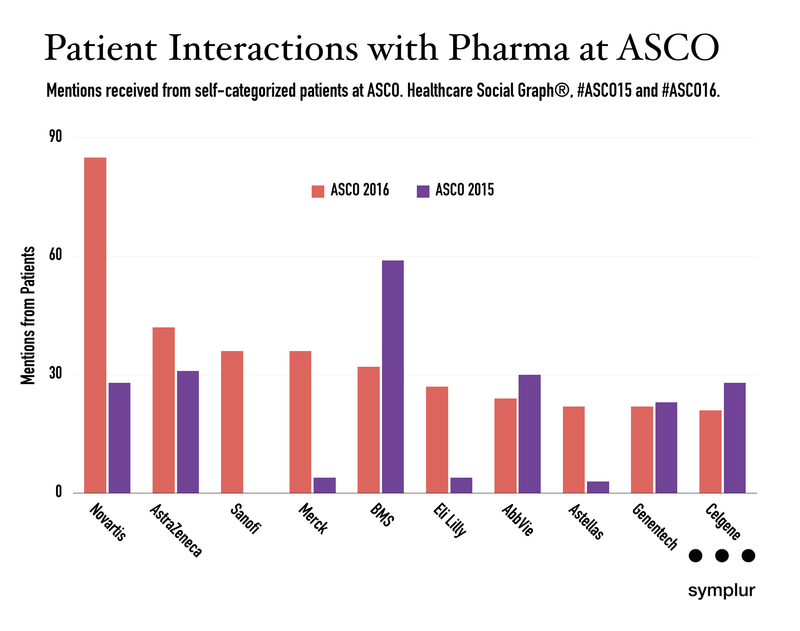 Data from the Healthcare Social Graph®, #ASCO15 and #ASCO16. One of pharma’s objectives at conferences like this is to engage, share information and their story with healthcare providers, wether in real-life at the conference or via social media. In the graph above we look at which top 10 companies received the most mentions from doctors, and the trend compared to previous year. Comparing number of tweets from Pharma with number of mentions from Doctors. 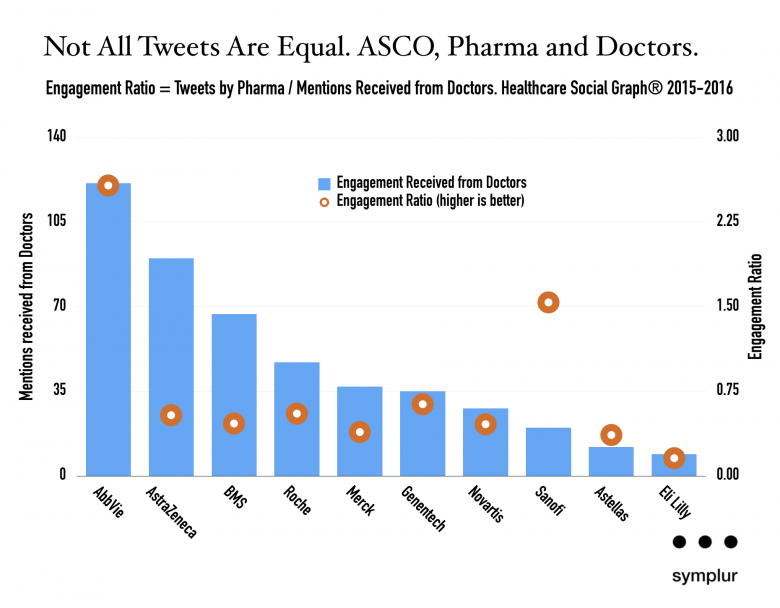 Engagement Ratio = Tweets by Pharma / Mentions Received from Doctors. Healthcare Social Graph®, #ASCO15 and #ASCO16. Part of this learning process of proper engagement is to identify the right balance of volume of tweets. The tweets from one pharma company during #ASCO16 was 167, while the lowest in this top ten list was 13 – an order of magnitude in difference. Not all tweets are equal. 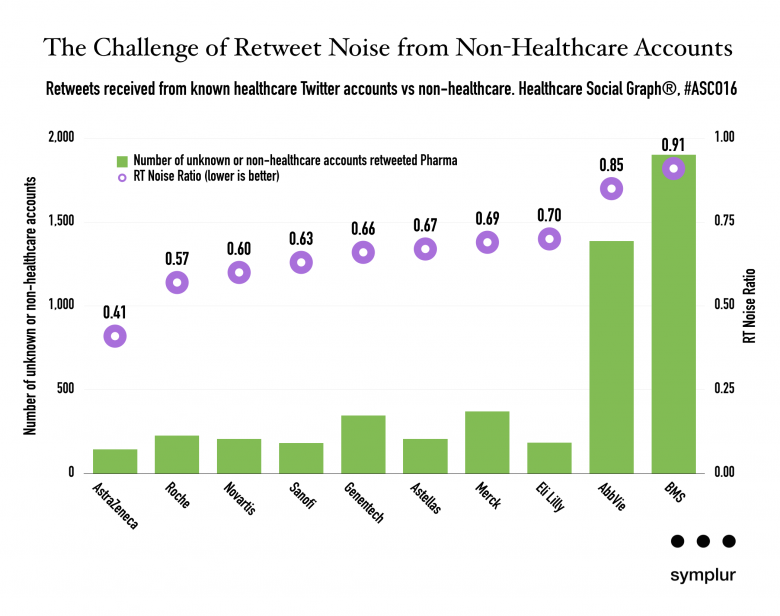 AbbVie was one of the companies with fewer tweets, but received much engagement from doctors. Less is more. A simplistic “Engagement Ratio” can be evaluated as a performance and efficiency metric in the graph above. A challenge for all large organizations on Twitter is the problem of retweet noise. Due to the nature of Twitter, there exist lots of bot networks that try to mimic organic behavior by randomly retweeting tweets. Organizations with lots of followers will have more of these than those with less. There also exist the possibility of paying for retweet spam, but Twitter has largely cracked down on this long ago. There will always be a challenge to find signal in the noise from large conferences like ASCO’s Annual Meeting with over 30,000 oncology professionals attending. But this retweet noise is contributing to the problem and this was noticed last year in this tweet by Dr. Deanna Attai. This retweet noise is unfortunate for everyone involved, we can only hope Twitter will be better at cracking down on retweet bots. Symplur Signals has a unique ability in this regard since it is powered by the Healthcare Social Graph® which has mapped and categorized millions of Twitter profiles known to be influential in healthcare. With this information we can easily segment the retweets by Twitter accounts who are known to be focused on healthcare, and accounts that are unknown to healthcare or simply non-healthcare. This “Retweet Noise Ratio” can be seen in the graph above, a lower ratio metric would be much welcomed. It is our goal that better culture and frameworks can arise to encourage and support more conversations between patients and pharma. None of us benefit from shutting our ears to the patient voices. In fact, the solutions to many of our industry’s ills will probably come from listening to their ideas and experiences. In the graph above we have visualized some of this interaction. These are mentions given by patients to pharma. We want to see this dramatically increase in the near future, but make note that not all interactions are entirely positive for all parties. Novartis’ 204% increase in mentions received year over year was also due to this issue originating from a regulatory concern, culture, or perhaps both. Regardless of the reason, it perfectly highlights what patients need from pharma and that all of us must work to make this happen.